It's been about 12 years since Ace Combat 6 was released, which means that a lot of gamers may not be familiar with the series and those who played the last game may not remember that much about it. 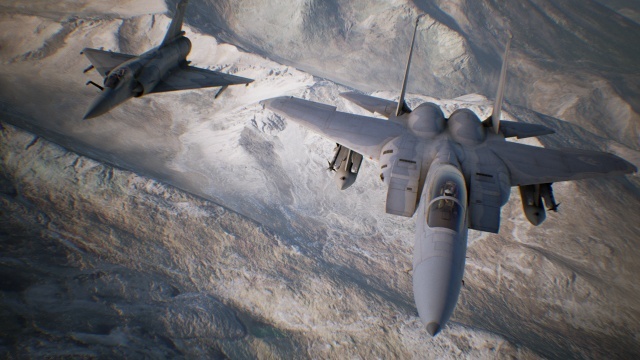 Ace Combat 7 ignores that fact, assuming that you're already intimately familiar with how the game is played and the universe in which it is set. There's not much in the way of introduction to either of those facets of the game, leaving you to figure out on your own how to use your plane and its systems, and to just what is going on in the world in which the game takes place. A few on-screen prompts serve as your introduction to piloting a fighter aircraft, but that's all you get. There are no tutorials and no instructions on how to use the different weapons that you can equip your plane with. Everything will be an exercise in trial and error, from how to aim your bombs on ground targets to how to land on an aircraft carrier. You'll eventually figure this all out on your own, helped by the fact that the game is an arcade simplification of air combat and not a full-fledged flight simulator. This lack of guidance extends to the game's missions as well, at times leaving you confused as to what you're supposed to be accomplishing at the moment as it happily informs you that you've run out of time to complete the objective anyway. The story is confusing as well, with cutscenes that tell the story of a woman who works with old pilots to cobble together a jet, is arrested for flying that jet, and then is recruited from prison to serve on a convict-ï¿½manned military unit the kind of which we've seen everywhere from Dirty Dozen to Suicide Squad. This all takes place against a backdrop of war, as two fictional nations, the Osean Federation and the Kingdom of Erusea, face off against each other. Your missions are more tied to the war than they are to the story about the pilot related in the cutscenes, and these countries have a history that has played out over the Ace Combat games in the past that you're left in the dark about unless you're a longtime veteran of the series. The fictional setting does give the game the excuse it needs to pit fighter aircraft from different eras and countries against each other, though. Air combat in the game is enjoyable, although it makes a number of arcade style simplifications. Your plane will have a default cruising speed and the triggers can be used to slow down and speed up, essentially giving you three speeds. By default turning is simplified to using the stick to make cornering turns, although with advanced controls the bumpers will give you yaw control allowing you to perform slip turns and more complex maneuvers. 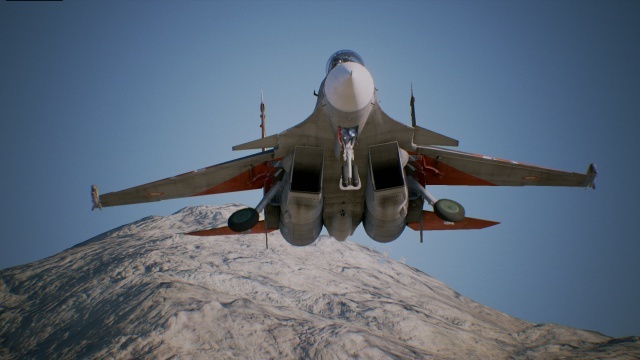 Your planes will also be capable of carrying well over one hundred missiles, although any special weaponry you load in addition to the standard armaments will be limited to more realistic numbers. There are a number of different real-world aircraft in the game drawn from the past fifty years of military aviation. You'll notice a difference between the different aircraft in terms of speed, maneuverability, and the amount of damage they can take, but not so much so that you'll see significant differences between them in combat. There's a tech-tree in the game which allows you to spend currency earned through mission and multiplayer performance that will let you purchase additional aircraft for use, as well as to improve the aircraft you own through performance and armament upgrades. Air-to-air combat involves obtaining radar locks on enemy aircraft so that you can fire missiles at them. Radar locks don't guarantee kills, though, as enemies can shake missiles especially if you fire one at a tightly turning plane and most enemy aircraft require two missile hits to be brought down. Missiles show up on your radar, so you'll be able to keep track on missiles fired at you so that you can try to evade them. Guns are available on your planes, as well, but it will take some skill to bring down anything but large, slow-moving aircraft with them. You'll also need to take out ground targets on occasion, but the bombs are difficult to work with in the game because the aiming mechanism is awkward to use. Since most ground targets can be taken out with air-to-air missiles as well, you'll often just resort to using them. The game is fun when it sticks to air-to-air combat, but when it strays from this it can be decidedly less so. "Stealth" sequences are particularly tedious as you'll need to keep your eyes glued to the radar to fly around the circles representing enemy radar coverage. The biggest issue with the game's mission design, though, is the aforementioned poor communication of objectives. This can be particularly frustrating when the game decides to put a timer on an objective. You'll run out of time without knowing what the game wants you to accomplish, forcing you to restart from the last checkpoint, replay part of the mission, and then be forced to do it all over again. Multiplayer has deathmatch and team deathmatch modes. Games are won not by kills but by scoring the most points. You'll get the most points from kills, of course, but there are other ways to earn points such as by causing damage to enemy planes. During a match, the current point leaders are designated by stars next to their planes on the HUD, and taking down a leader will give you bonus points for the kill as a way to keep things competitive. The game uses a lobby system for matchmaking - a host will create a lobby, set the game parameters, and wait for players to join. Game parameters can include banning special weapons and setting a point maximum on planes and loadouts to keep the planes more on an equal footing. The multiplayer mode is exciting and a little bit addicting, as human gamers provide for a level of challenge that you just can't get from the AI in the single player campaign. If you own a PSVR headset, you'll definitely want to play the game's VR missions. A flight combat game takes on an incredible level of immersion when you're sitting in a virtual cockpit and looking around to spot enemy aircraft above and behind you. 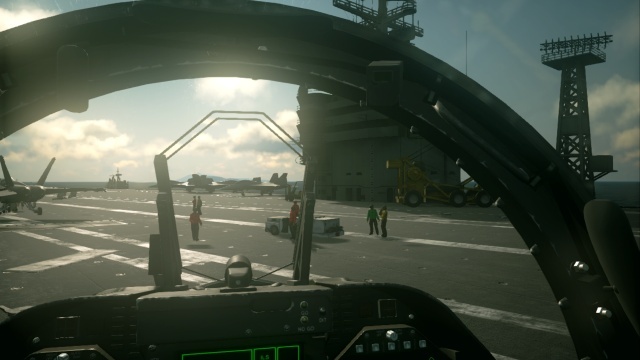 The first mission will have you looking all around you in amazement before you even take-off, as it starts you on the hangar deck of an aircraft carrier and lifts you on an elevator onto a flight deck in the midst of a launch operation before catapulting you into the air. The flight in VR mode takes on a whole new dimension as your head will be on a swizzle stick as you look to get a visual on enemy aircraft rather than keeping your eyes glued to the radar screen, Even out of combat the game is more enjoyable in VR as you can look down out of the canopy and watch the world pass under you. You might be concerned that with all of the maneuvering you need to do in air combat that the game is a recipe for nausea when played in VR, but I never found myself even getting lightheaded while playing. The biggest disappointment with the VR mode is that it only provides you with three missions. Final Rating: 74% - Fly the confusing skies.